Your favorite British WWII movies made during the war? Discussion in 'Books, Films, TV, Radio' started by AJhoward, Sep 15, 2018. Of the British movies produced during WWII, which are your favorites? canuck and Owen like this. I don't know as many British wartime movies as I probably should know. I do like The Way Ahead and Went the Day Well. Both of these are about as good and honest as war movies can be when made in wartime. British wartime war movies make our own wartime war pictures look childish by comparison. brithm, canuck and Seroster like this. I love "The Way Ahead." My favorite character is the surly older veteran at the beginning. He's hilarious. "Went the Day Well" is incredibly suspenseful. Me & my 13 year old son both agree on 'The Way Ahead ' being a great film. He's just said he likes 'The First of the Few' , with David Niven . All good so far, I watched The Small Back Room (1949) on a long flight last year and thought it was very good. No Highway in the Sky (1951) is one of my favourite RAF films. Oh, and Ice Cold in Alex, obviously. Ah, apologies--I can't read after two beers. I offer In Which We Serve by way of sorry. "The First of the Few" is wonderful. I've seen the rough copy that is on YouTube. "We Dive at Dawn" with John Mills. Yes I liked "the First of the Few" too. brithm and bamboo43 like this. 'Went the Day Well ?' is one of my favourites as well and 'We Dive at Dawn' is one of those that I can't resist if I'm housebound with a cold or something. A hot lemon with whisky and a 1940s film. Nothing better. Don't be too hard on non-British films, TTH. 'Casablaca' is fantastic and I find it hard not to stand for the Marseillaise scene. brithm, 4jonboy, bamboo43 and 1 other person like this. Casablanca probably belongs in a parallel category - wartime drama as opposed to war movie? But it remains one of the finest films ever made. I don't think I've seen any of these films, so I'm just taking notes. I'm with you Lesley, We Dive at Dawn. Dunkirk (the John Mills version) is amongst my favourites too. Anyone interested in the inter-war British Army ought to have a look at the 1937 John Mills film 'O.H.M.S. It's all rather predictable but uniforms are accurate and the drill first-rate. Another Mills film, 'Old Bill and Son' (1941) is one of the few that deals with the phoney-war. Once again, tending towards the corny, it has a terrific period feel and was written by Bairnsfather himself. The Way Ahead and In Which We Serve. 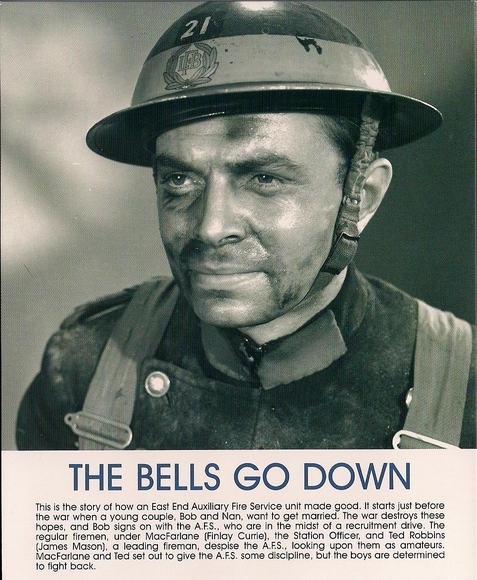 `The Bells go Down` featuring comedian Tommy Trinder playing it straight (ish) with James Mason.